What do women’s health screenings; increasing the number of science, technology and math teachers; building the infrastructure of African countries; building the client base for projects with a social benefit; and creating a shared office space for social entrepreneurs have in common? All of them involve efforts that can be strengthened by systems thinking. 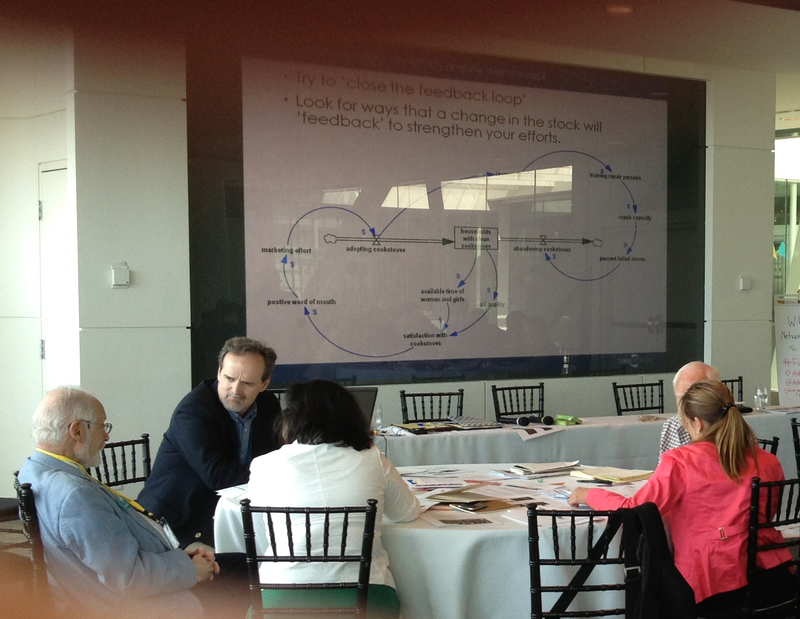 That’s what a group of more than fifty global leaders discovered in a session at the Ashoka Future Forum where I and David Castro (president of I-LEAD and an Ashoka Fellow) introduced the basics of Systems Thinking for Changemakers using four simple steps. From the intense (and playful) effort in the room and from the feedback afterwards, I was reminded once again, that, for people struggling everyday to steer and influence complex systems, the basic tools of systems thinking are a gift, an inspiration, and a way to share stories with others. The Ashoka session was a reminder of exactly why we are launching the Climate Leader – to bring the benefits of systems thinking to people on the front-lines around the world in the battle for a liveable planet. You can find out more about these upcoming free online classes and sign up here; but in the meantime here’s a quick recap of the 4 steps the Ashoka participants experimented with. Identify a key ‘stock’ you are working to change. Whether you are trying to increase the number of girls in school or reduce the toxins in a river basin, most likely your change efforts are trying to ensure more of something people would like to see, or less of something that is creating a problem. Becoming clear about that stock, how it has behaved in the past and how it might change in the future is a first step towards being highly strategic in influencing the system you are working to change. Identify the ‘inflows’ and ‘outflows’ to your stock. How do girls end up in school? How do toxins end up in the river? Those processes are the inflows. What leads girls to leave school? How do toxins leave the river? Those processes are the outflows. Identify your own strategies to influence the system. Are you boosting an inflow? Limiting an outflow? Those are the only two ways to make the level of a stock go up. 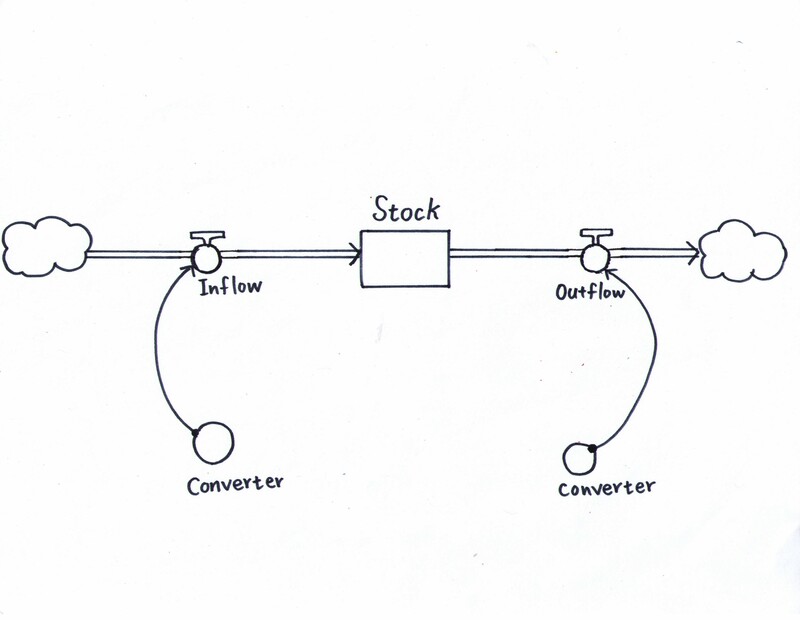 Or, if you are trying to lessen a harmful stock, are you blocking an inflow, or boosting an outflow? Once you are clear about the inflow and the outflows, other questions rise to the surface. For example, perhaps, as one participant noticed, you’ve been focusing on increasing an inflow of people into a program, but never asked yourself if anything could be done to limit the outflow of people who leave the program. Look for ways where you efforts might build upon themselves. Can an increase in your key stock change the world in a way that leads to boosts in the inflow into the stock? If so, you’ve found what systems thinkers call a reinforcing feedback loop and you are well on your way to helping the system you care about transform itself. Of course, it is impossible to compress a 2 hour workshop into a few paragraphs, and even that 2 hour workshop barely scratched the surface of the large body of work that is systems thinking. There are a number of great books available to explore the field more deeply (I’d recommend Thinking in Systems by Donella Meadows), and for those particularly interested in applying systems thinking to our human response to climate change please sign-up for our new online courses at The Climate Leader. I’d like to see buffers (eg ocean acidification and ice melting) but even the basic stock-flow diagram can be a handy reminder that we’ve spent 20 years debating policy responses that really just focus on the inflow of emissions. There is no international agenda for effective policy on the atmospheric stock of GHGs. Even the ngos that campaign on this seem to have no real policy agenda beyond anti-fossil fuel protests. A ‘stock policy’ would switch our thinking from incremental shifts in emissions (irrelevant) to radical shifts in emissions and radical shifts in outflows from ecological expansion and biochar. Then we could start to talk about policy leverage points – exciting!